The bug bit. Though I don't know exactly how or when it happened, but I'm now immersed in ham radio again after many years of being away. And it's great to be back! 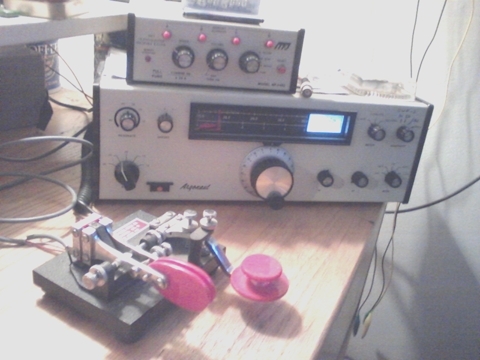 Early in 2012, I started the process of reclaiming my first ham call sign, WN1MBK, by jumping through the FCC's online series of hoops they call their Automated Licensing System, or ALS. I stumbled somewhere along the way, put the application on ice for a spell, and then received a letter stating that my application was dismissed without prejudice, if I remember the FCC legalese. After some time and giving more thought to reclaiming WN1MBK, it occurred to me that both my former novice call as well as the subsequent general and advanced call, WA1MBK, were frequently problematic while operating CW. Specifically, the "K" was often mistaken for the trailing "end of transmission K."
In keeping with the spirit of the original quest, WN1MB seemed a logical workaround. So I reapplied. Thanks to the FCC vanity call sign system and advanced class 2X2 calls, WN1MB was finally secured in June 2012! It was a relief to retire KE1HP, a call sign aquired in a mania to "change stuff" in 1997. If memory serves, I only made one or two contacts with that call, so it never really felt like it was mine. WN1MB "rolls off the fingers" nicely, though. As luck would have it, I found one on eBay and through the kindheartedness of my special, surrogate bidder (I refuse to deal with the PayPal robbers), "we" won the bidding at $149. That's $27 and change in 1972 dollars! And the best part? It's serial number is 00036! Uhuh! 36th off the line! Next was an antenna tuner. As I live in a downtown, Main Street efficiency apartment, indoor and in the dark of night stealth antennas are my only real options here. Another eBay auction netted a variable capacitor and a local ham flea market netted a nice coil, cables, and miscellaneous other "hook up stuff." Though the tuner sure ain't pretty, it works and I've loaded up a variety of metal with mixed results. More on this antenna silliness in a subsequent post. The Nye Viking hand key I had saved from way back when worked well enough, though as my code speed came back rather quickly, it was obvious I'd need some sort of paddle and electronic keyer for higher speed sending. A few Benchers caught my eye, again on eBay, but I didn't bid. And I'm glad I didn't. Many moons ago a friend let me try his Brown Bros. CTL-B combo paddles/hand key. "Some day," I thought, knowing that, though silky smooth, at the time the cost was prohibitive (around $70). And they were a "want" and not a "need." Wouldn't you know it, but a nice CTL-B shows up on eBay (of course) and I couldn't help myself all these years later. After a flurry of last minute bidding by many folks, the CTL-B was mine! Suffice to say, I spent considerably more than what Brown Bros. asked for them in the 1970's. I'm not complaining, though. The CTL-B is a wonderful addition to the shack. I missed the bidding on the MFJ 482 Grandmaster memory keyer and apparently nobody bid on it. I was able to contact the owner outside the confines of eBay and arrange the purchase and shipping. Though I had a couple of issues with it, I've ironed a couple of things out already. More on this later. It was a good purchase, though, and I'm happy with it thus far. So I'm back on the air. WN1MB lives. Info on antennas, operating, and plans will be covered in future posts. Listen for my CW between 7025 and 7060 kc and give a call. 72/73!